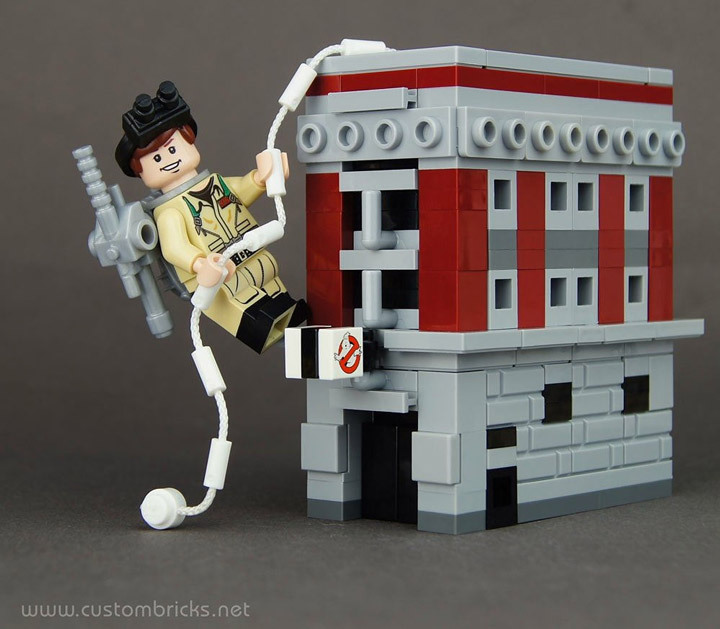 Is your Lego Store (3300003) looking a bit lonely on your shelf? 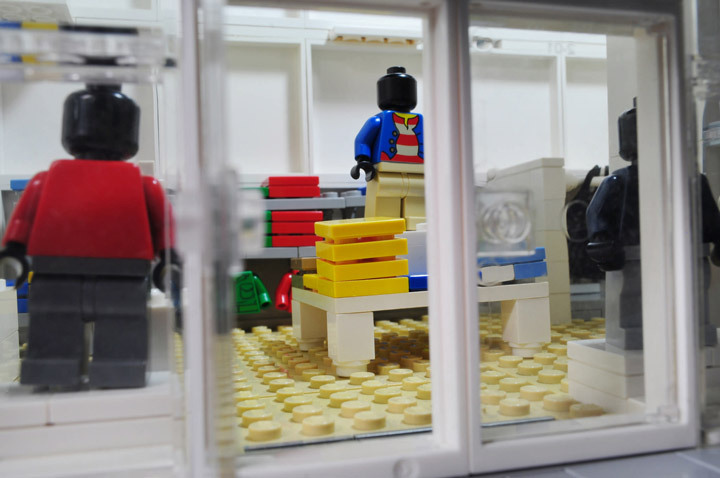 This Lego Uniqlo store is the perfect companion. The building has been designed with modularity in mind. You could create a whole series of box stores, and recreate an outdoor mall. This MOC is the creation of neruneruneranai, who worked hard to get a lot of the details correct. 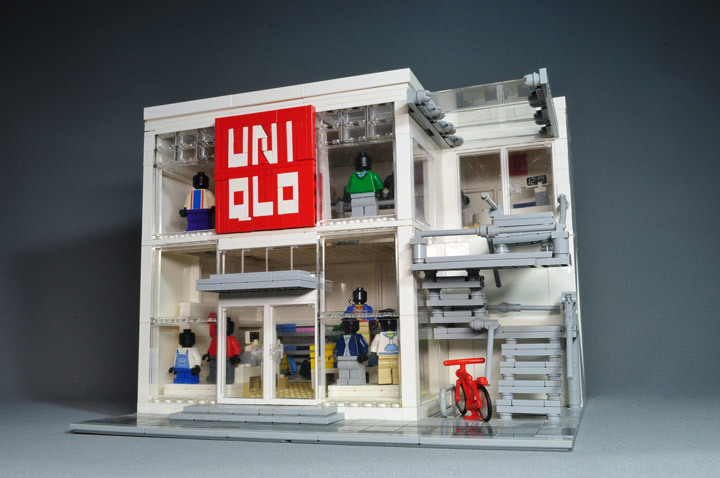 The brick built sign in front is an almost perfect recreation of the Uniqlo logo. If you look at the details in the interior of the building you will see haphazardly stack clothing, and a lot of bright colors. Just like a real Uniqlo store. This is the place to go if your Minifigures are looking for some new pants or shirts. Lego MOCs come in all shapes and sizes, and some of the most remarkable are the also the largest. 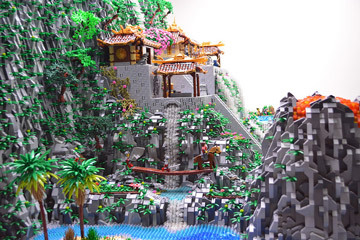 This is the Samurai Code; a gigantic MOC created by Ben Pitchfork. Just the cost to build something like this is something to marvel at. 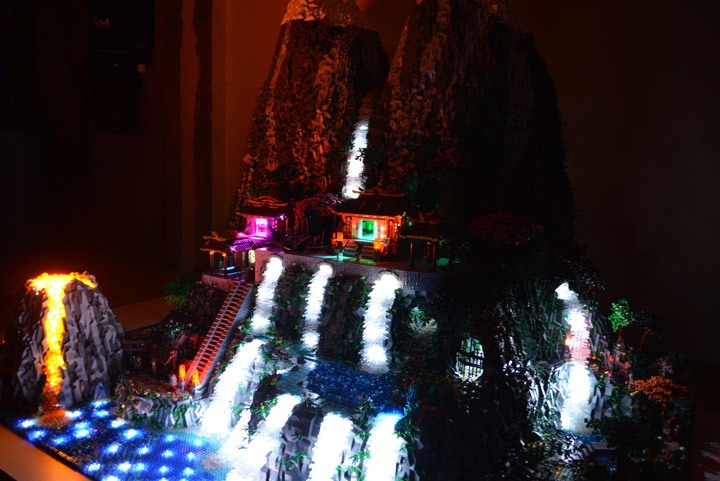 Thousands and thousands of Lego pieces make up this huge Japanese volcanic island. 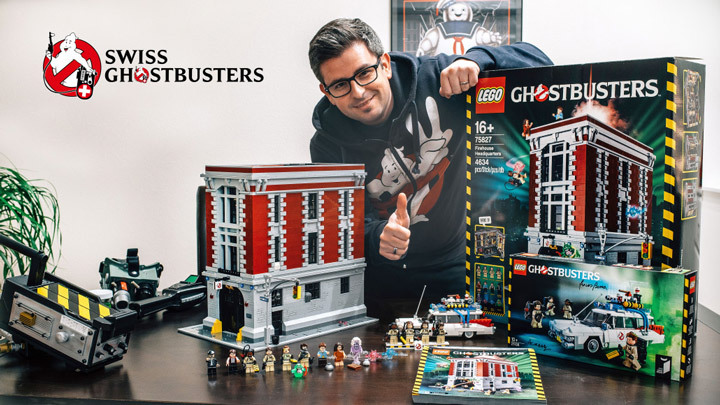 This project has a little bit of everything, a huge MOC, a Lego Ideas proposal, and time-lapse video. 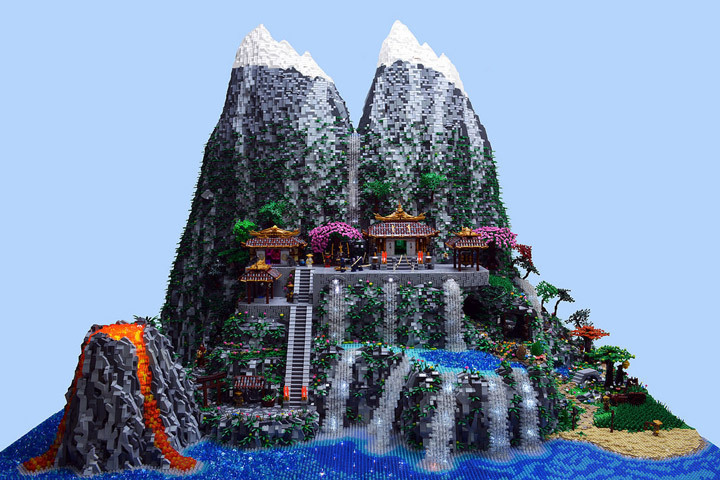 Featuring an ancient shrine (or samurai dojo), a huge mountain lake, multiple waterfalls, a volcano, beach, rope bridges, islands, steep cliffs, winding paths, and lots of little secrets. This is a masterpiece. The best part is the whole thing has been wired up with LEDs. Giving these twin peaks a whole new atmosphere in the dark. The lighting brings out new details, while creating dangerous shadows. 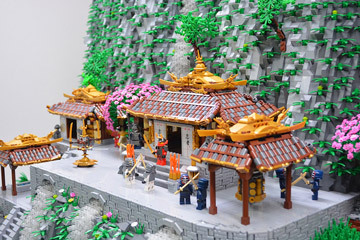 A piece of the Samurai Code has been carefully recreated as a Lego Ideas project. Go vote! “Recreate the old tales of traditional Japan with a highly detailed, yet realistic model of ancient Japanese architecture. Featuring one model that you can customize into an ancient shrine or a samurai dojo. 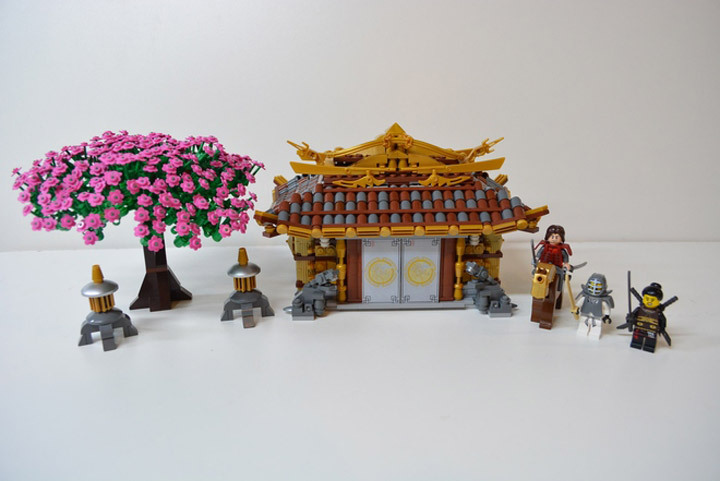 Includes a cherry blossom tree, 2 decorative lanterns, and 3 minifigures with a horse. 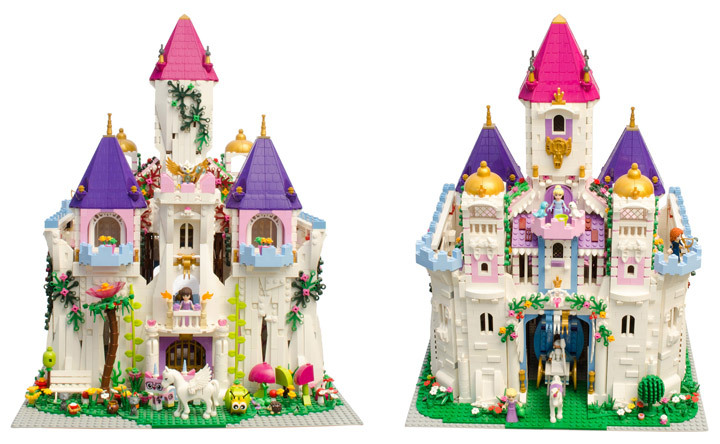 Fantasy and Castle based MOCs are usually extremely limited in their color palette. Mostly gray, green and brown. It always seems that you cannot have enough of these colors. But, every once in a while an MOC comes out that explodes with color. This is Root Canal, created by Lab Synth. “Root Canal takes its name from the old tree that adorns its small plaza (some say its double entendre is an ironic allusion to the pain one feels when learning about the prices of its palaces). It is made of a tight succession of palaces, whose proprietors strive to maintain in tip top shape in a sort of non verbal competition that neighbors of the area like to have between them. 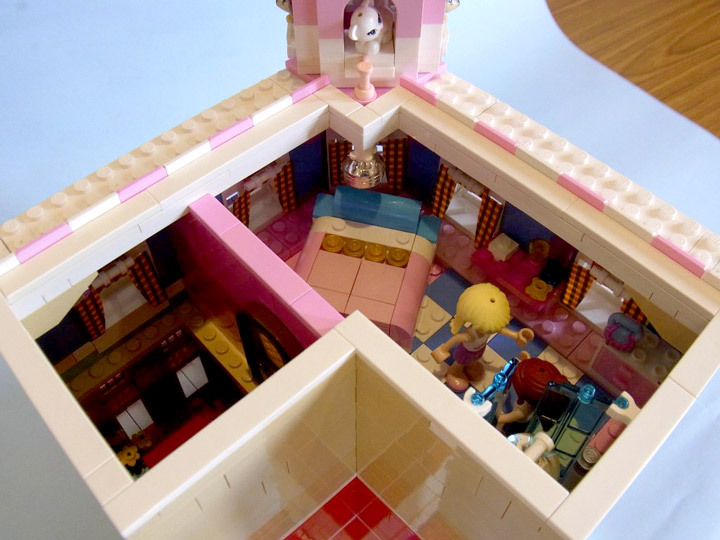 The richer the material the better, leading to some extravagant decorations and architectural details. Winter is here, which means peaceful white landscapes, bitter cold, and a lot of hard work shoveling. 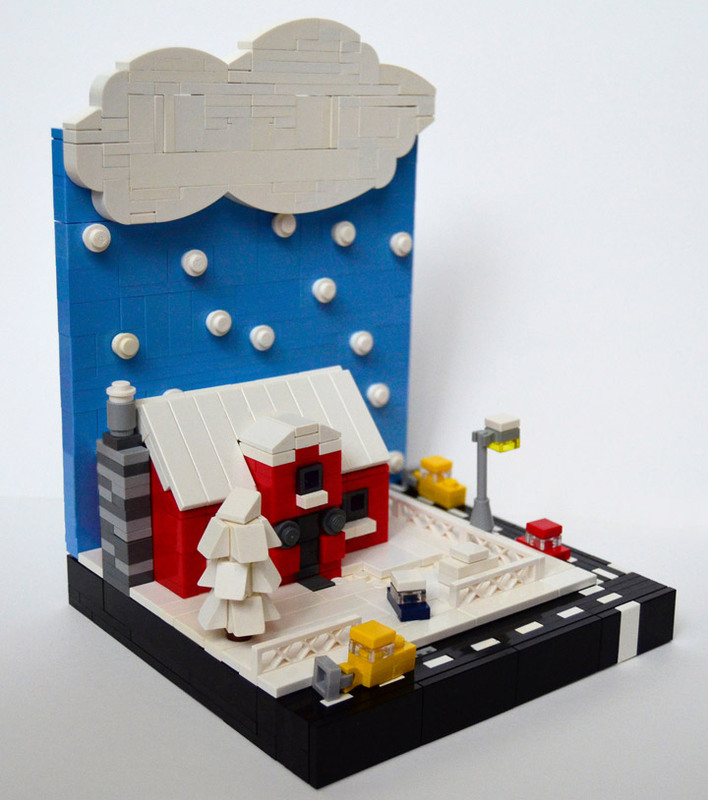 Hornet Razvan has created a charming Lego Microscale Winter Vignette. 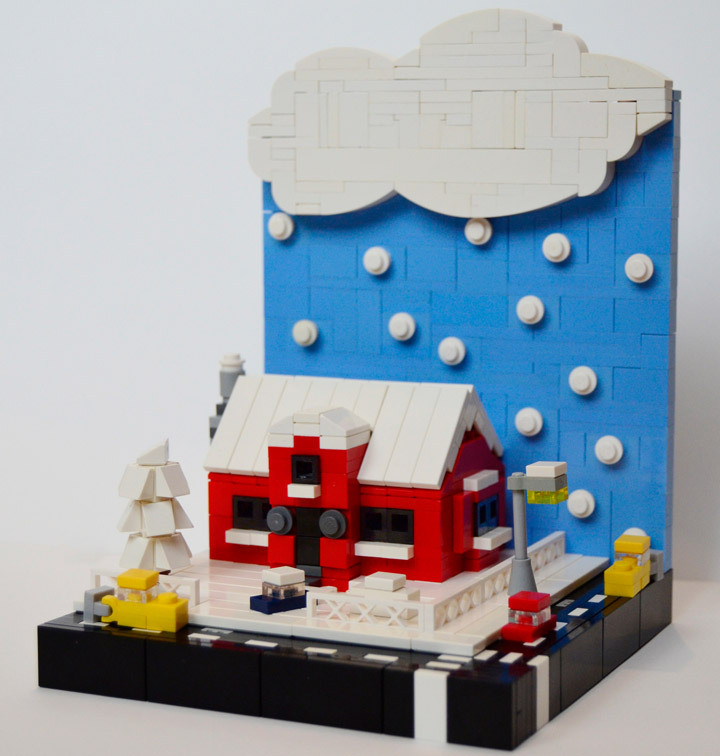 An iconic red building is the center piece, but the giant clouds and snow Lego built background is what makes this stand out. There are even some extremely tiny cars trying to drive, and two little snowplows keeping the roads safe. 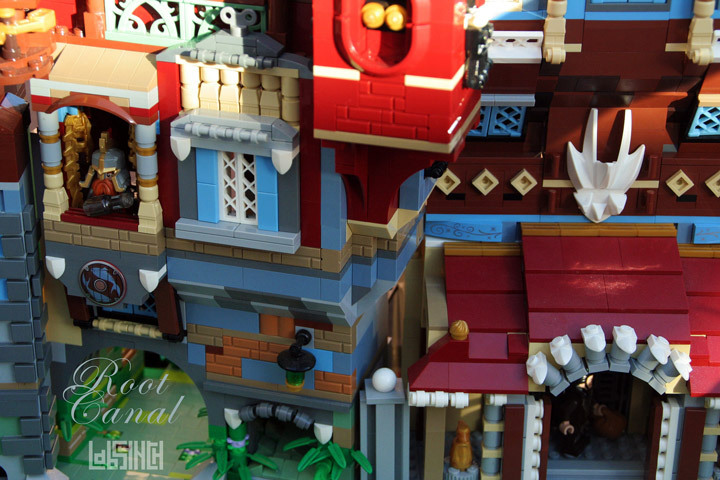 The epic Lego Ninjago Temple of Airjitzu has just been announced. 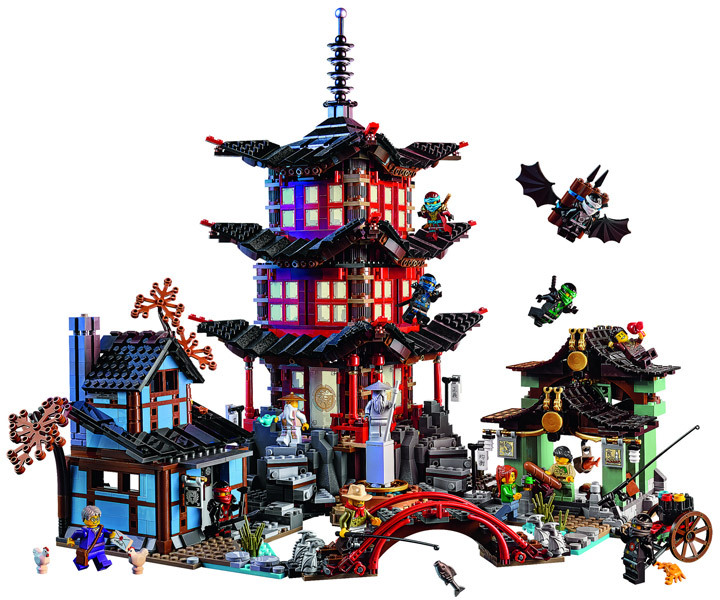 It is a massive 2,028 piece set, making this the ultimate Ninjago set. Not only that but it includes 12 Minifigures. These will include Lloyd, Kai, Jay, Zane, Cole, Nya, Wu, Misako, Dareth, Postman, Jesper, and Claire. An easy way to get a full collection of the Ninjas in their rare black outfits. The main Airjitzu Temple is flanked by a Blacksmiths workshop and a Smuggler’s Market. All connected with a charming bridge. 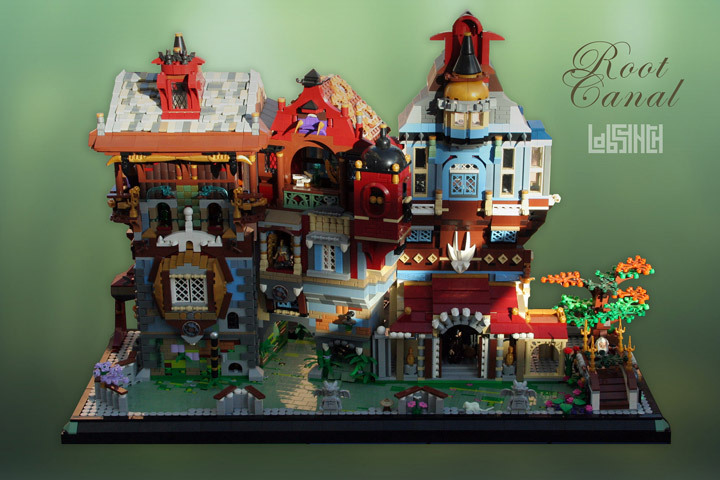 This set is very reminiscent of the super popular Medieval Market Village from a few years ago. There is even a fully working Shadow Theater in the Temples basement. With moving parts, and light up features. 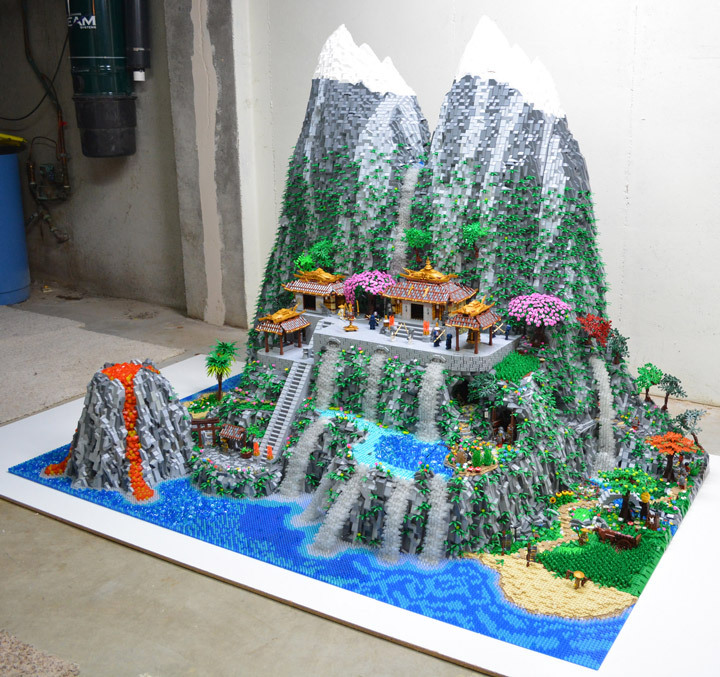 Another great thing about the Airjitzu Temple is that Lego has kept the craziness of the Ninjago theme to a minimum. Making this a great set for collectors. This announcement is perfect timing for the San Diego Comic Con (SDCC), where it will be displayed for all to see. 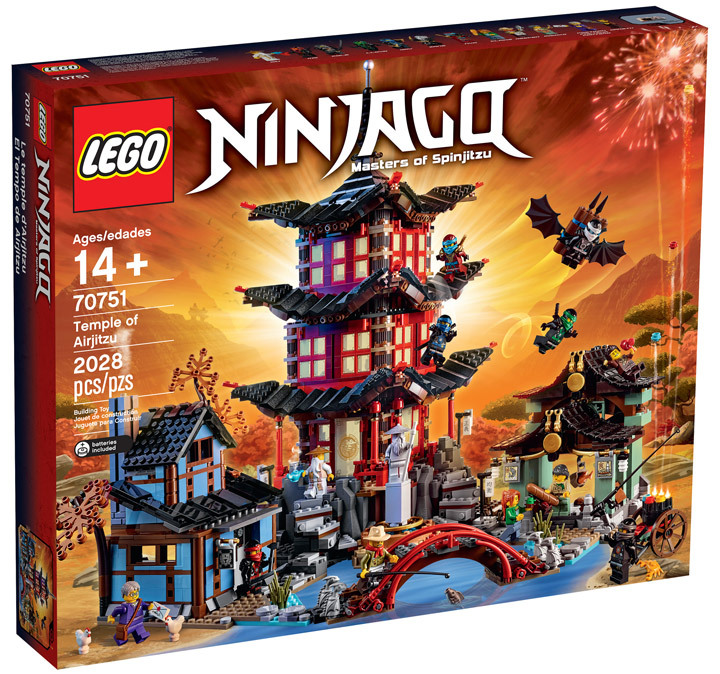 The official release date of the Lego Ninjago Temple of Airjitzu will be September 2015, and if you are a VIP Member you can pick it up a few weeks early on August 18th. “Join the Ninja at the beautiful Temple of Airjitzu! Enjoy the ultimate LEGO® NINJAGO™ building experience as you construct the majestic Temple of Airjitzu and surrounding village! The highly detailed Temple building has many delightful architectural features including Oriental–style decorated windows and sliding doors. 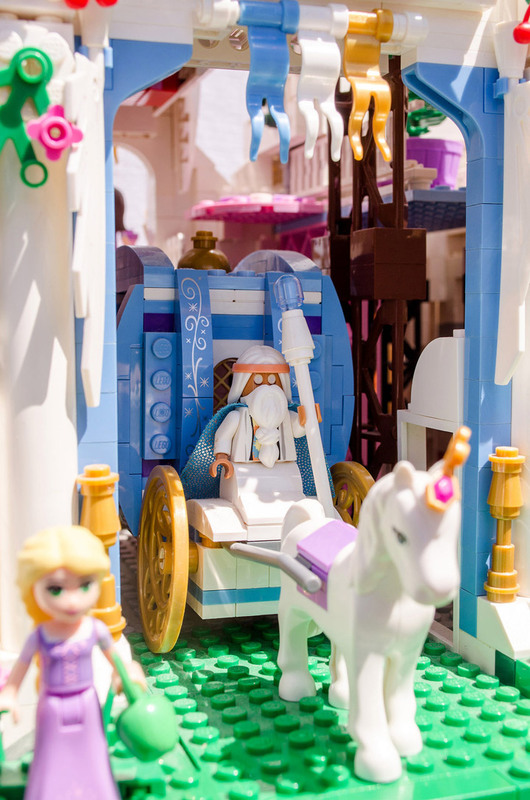 The intricate wooden-frame-style walls of the nearby Blacksmiths and beautiful curved roofs of the Smugglers Market will also test your LEGO building skills. 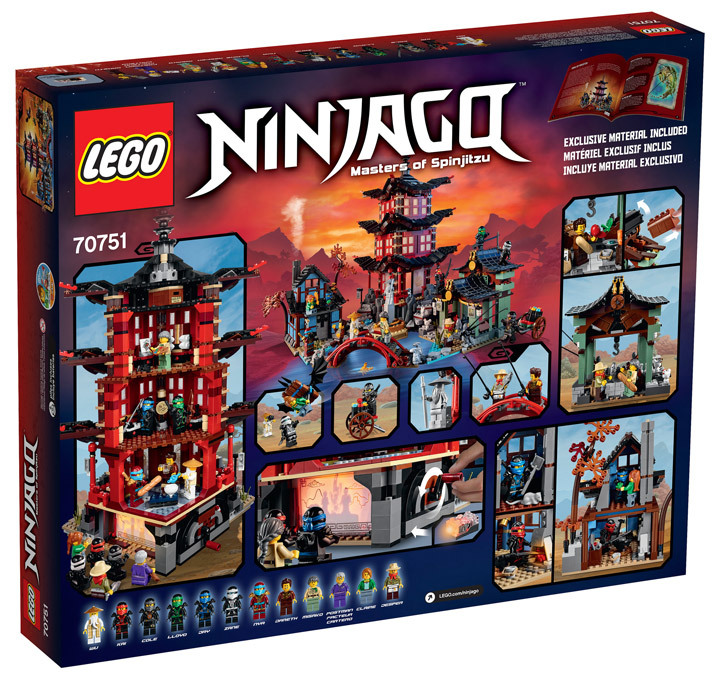 And with every Ninja included in one set for the first time, plus loads of other key characters, you can role-play all your favorite NINJAGO adventures. Take tea in the reception area of the Temple, practice your Ninja moves in the training room or join Wu in his study to read or paint. Discover the Ninja glider upstairs at the Blacksmith’s workshop, cross the bridge guarded by the stone dragons and seek out hidden treasure at the Smugglers’ Market. Then turn off the lights in your room to watch the Temple’s illuminated spinning shadow theater! • Includes 12 minifigures with assorted weapons: Lloyd, Kai, Jay, Zane, Cole, Nya, Wu, Misako, Dareth, Postman, Jesper and Claire. There a whole lot of details hidden away in this set, so make sure to watch the Designer Video below. 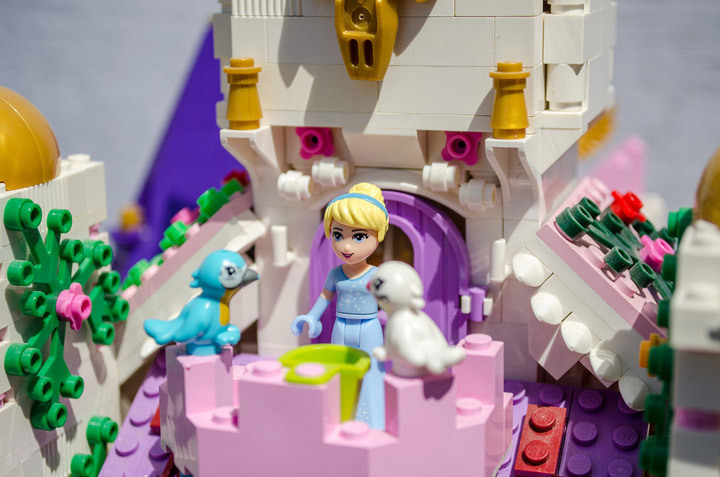 All of the Lego Friends and Lego Disney Princess figures need a place to stay. Especially if they need to fend off a horde of baddies. This glimmering white castle is the creation of Hrczs1. 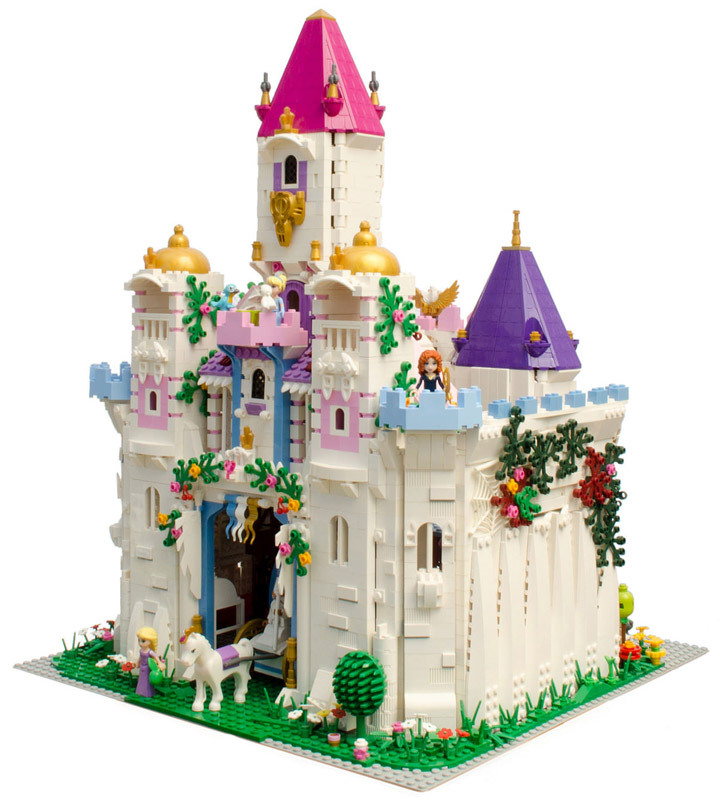 It features a keep and two towers, making an amazingly compact castle. There is very little room to spare. While the overall design is compact it is tall. Creating a kind of forced perspective trick that creates the illusion of size. The design is highlighted with purple, pink, teal, and gold trim. The most charming detail is the balcony attached to the central keep/tower. It looks like something out of Sleeping Beauty. A nice detail is that Cinderella’s Carriage fits perfectly inside of the gate. See if you can spot some of the other hidden details. 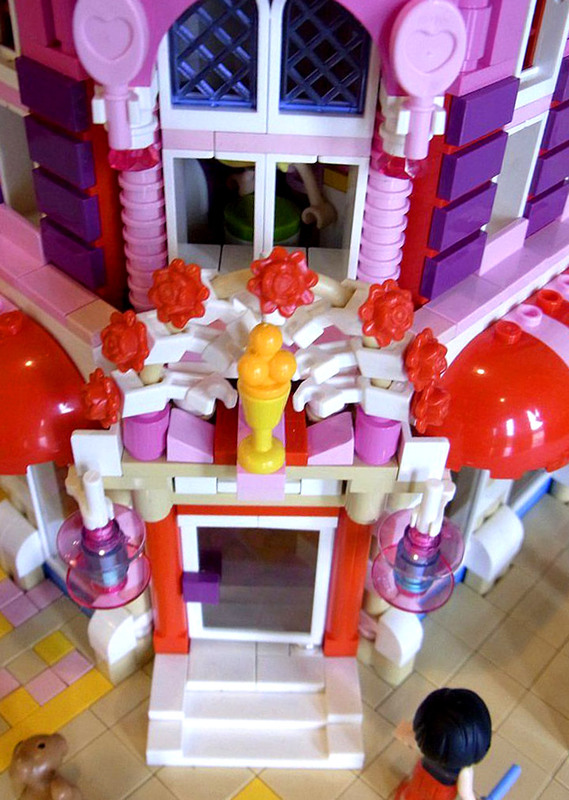 The Lego Friends: Lovely Hotel is extremely charming and popular. 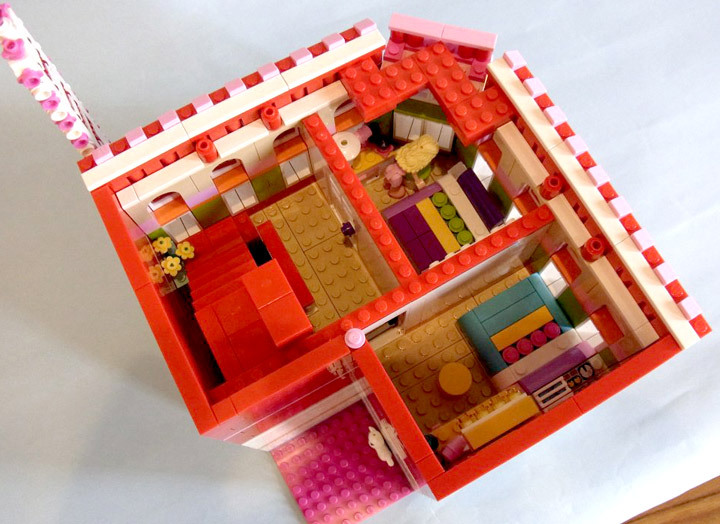 This Lego MOC is amazingly difficult to find, but a few more photos of this modular hotel have surfaced. 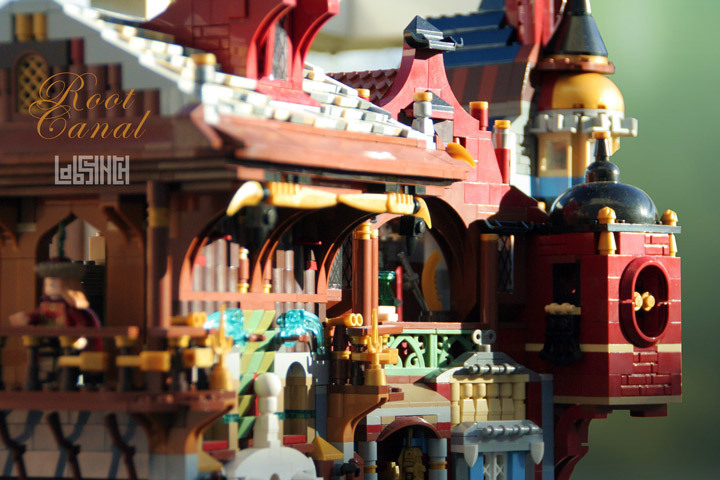 The Lovely Hotel made its first appearance at the Fujiyama Lego Camp ’12. This pink and purple Cafe Corner mod was displayed between the other town and train creations. 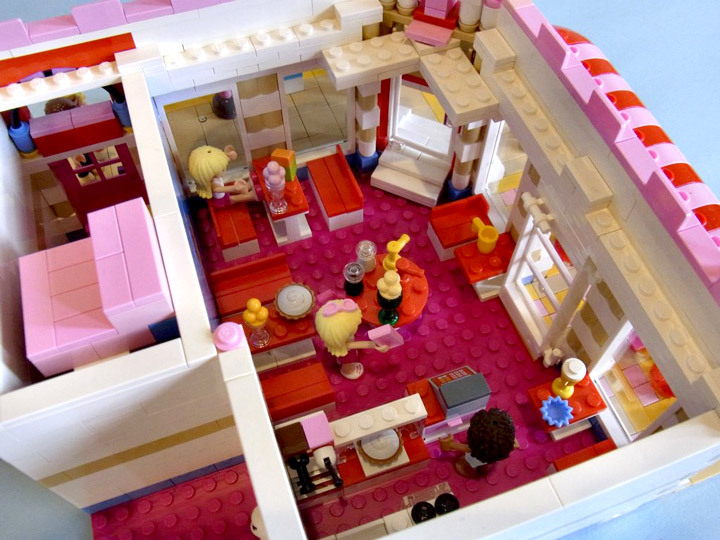 This is a total conversion of the famous Cafe Corner (10182), replacing everything with Friends inspired details. 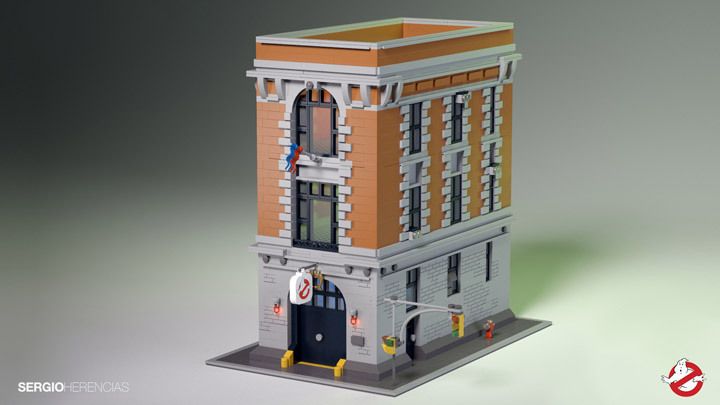 This creation would fit in perfectly in any Heartlake City display, and would be at home in a Modular Building layout. When entering the Hotels front entrance an Ice Cream parlor can be found on the first floor. 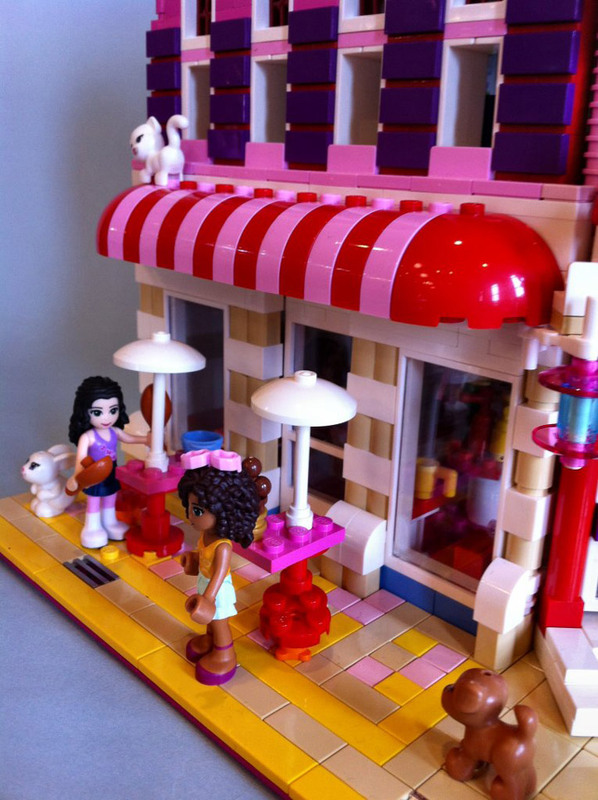 Here the Lego Friends can chill out and watch the coming and goings of the crowded streets outside. The entrance into the building can be found on the right side of the building. The first two rooms occupy the second floor, accessible from the narrow staircase. Each room features a stylish bed, and vanity. On the top floor is the penthouse suite. This room is jam packed with a full bathroom, bed, vanity, telephone, chandelier, and even custom curtains. 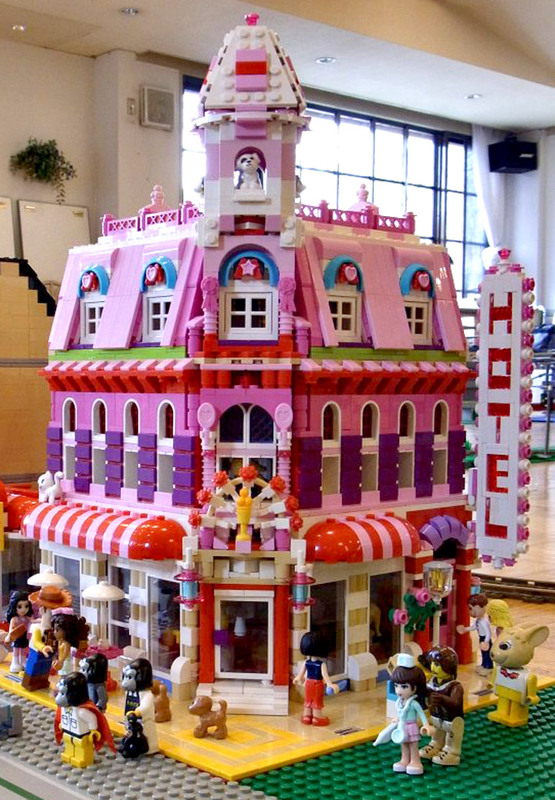 If you find more information about this Lego Friends Lovely Hotel please let us know (here).